OK, so the first thing to do is to cover your table with a cloth or newspaper, so you don't get it covered in papier mache or paint. Ideally, you need to have access to the table for the minimum of a week, or as long as you're going to spend making the pinata. It took us exactly 7 days to make, working on it every evening, so I'd say a week is a good time to set aside for this. If you're mum or girlfriend are going to need the table, make sure you're especially nice to them in the run up to making the pinata. Then, get all your pinata ingredients together. Put them all out on the big table, and double check that you've got everything you need. Basically you mix the wallpaper paste with some water, and then stir for a bit. Make sure you make enough to keep you going throughout the week. This stuff will last, as long as you keep it covered after every session. Now that you've made your papier mache mix, cut up some paper into long strips - I'd say 1 inch wide by 6/7 inches long, but no need really to be exact. Make sure you've made enough to do about 3 layers of your mould. 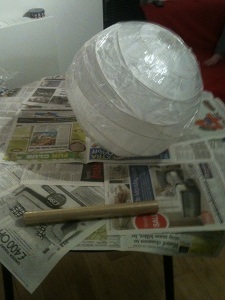 Take your mould (in my case a lampshade), and wrap it in clingfilm, as shown below. 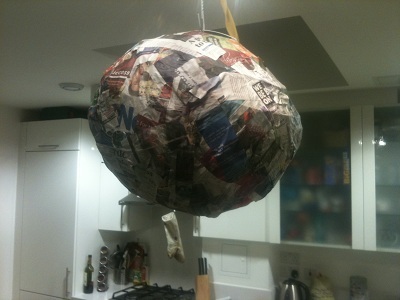 The idea with this is that once you've built up the papier mache base, you can easily remove the papier mache from the mould. Using a paint brush, start applying the papier mache mix to your strips of paper, one at a time, painting both sides of the paper. 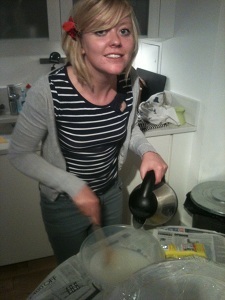 Then apply the strips on top of the cling film. 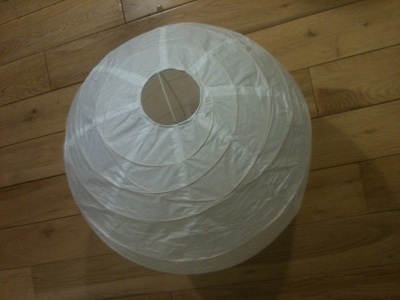 Do this until you've covered the entire lampshade (apart from a whole at the top where you're gong to put sweets in) and leave it somewhere safe to dry - preferably hang it up somewhere, otherwise you may end up with a big dent in you Death Star if you leave it to dry while it's lying on something. We then left it for 24 hours, found that it wasn't dry, tried to dry it with a hairdryer (which didn't really work), before leaving it for another 24 hours. After 48 hours, we decided to add another layer. This was where it got complicated. Adding paper on top of paper, it becomes difficult to know how many layers you've added. 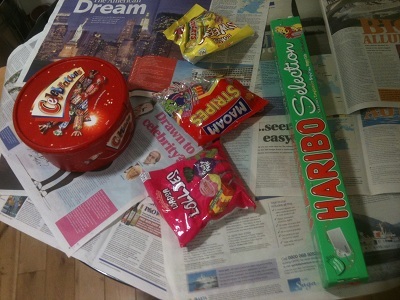 Thinking about it, I should've tried to use different coloured newspaper for each layer. 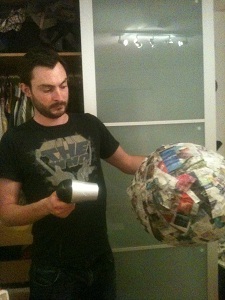 Instead, I just added more and more newspaper to make sure I'd done another layer. The problem with this, as I was later to discover, was that I hadn't completely coverd the Death Star with a second layer. 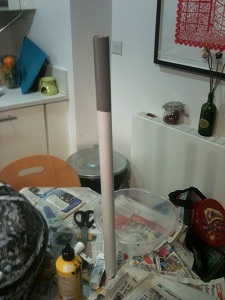 We then left for another 24 hours, before adding a final layer, and leaving to dry. 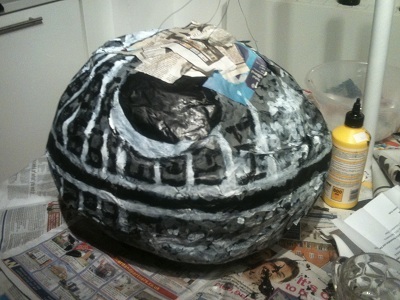 The shell of the Death Star wasn't strong enough to withstand painting. 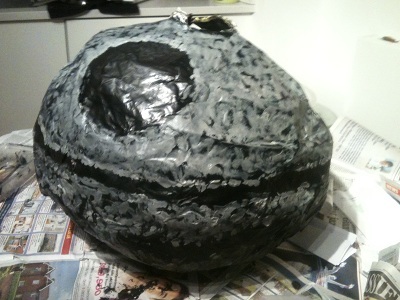 As I painted it, the paper got wet, sagged, and the Death Star became mis-shapen. Some parts were so weak that it just ripped. I should've left the mould in while I painted it! 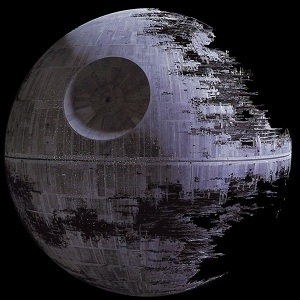 The Death Star isn't black - it's grey! Why did I paint in black? I started to panic. I thought the whole project was ruined, and I'd wasted all my time. As it turned out I hadn't. I left it 24 hours to dry before I did anything else. 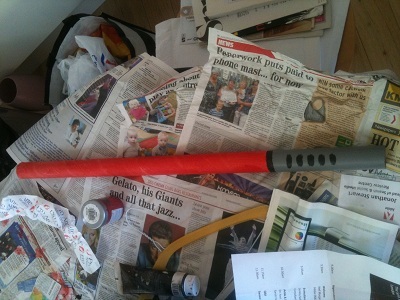 What we then had, was an almost finished shell, with an almost entirely finished paint job. Yum! Again, in retrospect, I shouldn't have added anything that might melt - the chocolate had pretty much melted by the time we came to smash it open. 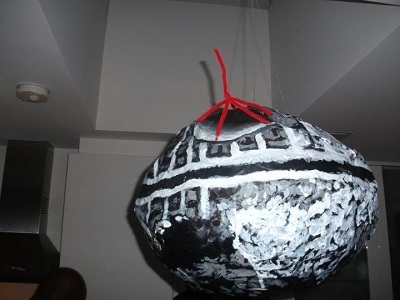 If you look closely, you can just about see the picture wire coming out of the top of the pinata. 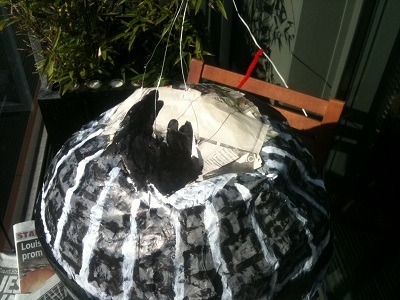 I did quite a few layers of papier mache for the lid - maybe 5 or 6. 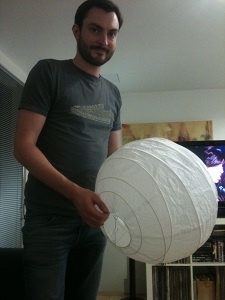 I didn't want the picture wire to be what caused the Death Star to collapse, so I made sure the lid was extra strong. 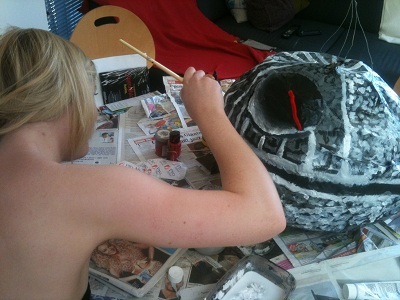 Again, we left for 24 hours, to wait for the papier mache to dry, before applying the final layer of paint. We also added the laser at this stage. Quite simply, take the red pipe cleaners, and cut into 4 pieces, each piece about 3 inches long. You'll need to make 3 of these come out from the laser turret. I used a pin to make 3 holes in the turret, through which I could poke the pipe cleaners. These three pipe cleaners need to join together at the other end - you can do this simply twisting together. You then need to add the fourth piece of pipe cleaner coming out of the other three, giving that 3-d laser effect. 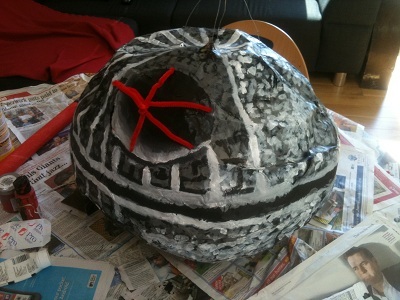 Now the Death Star is fully operational! 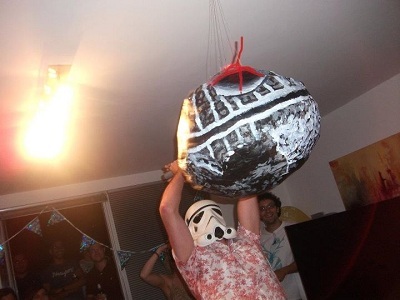 And voila, if you've done all that, you'll have your Death Star pinata, ready to smash up! We then hammered a hook into the ceiling, created a loop in the picture wire, and hung up the pinata. At this point, someone told me that you were meant to hit a pinata blindfolded (I didn't know this). 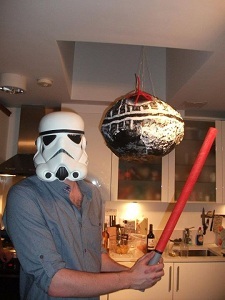 That's when I came up with the idea of everyone having to wear the storm trooper helment, which had been a birthday present from my old flatmates. Anyways, happy smashing!